A research team led by ECE Research Scientist Christopher Davis was featured in "Physics News in 2006," an annual news summary published by the American Physical Society (APS). The team was touted for their research on the advanced applications of plasmon technology in a plasmon microscope. Plasmons, electron waves generated when light strikes a metallic surface, are utilized in the microscope to help scientists see fine, nano-scale details that were previously undetectable. 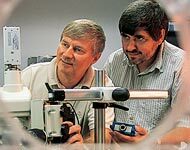 The APS news summary stated that Smolyaninov, who was recently named to the Scientific American 50 list, and his colleagues "were able to image tiny objects lying in a plane with spatial resolution much better than diffraction would normally allow." Smolyaninov, Davis, and their research associates are developing a two-dimensional plasmon microscope that is ideal for imaging living cells, and could operate much like a point-and-shoot camera. The team believes they can improve the resolution of their microscope images down to around 10 nanometers. The width of a human hair is approximately 80,000 nanometers. The technology was previously featured in an APS news article in October 2006. Smolyaninov, Davis, and their research colleagues are developing a two-dimensional plasmon microscope that is ideal for imaging living cells, and could operate much like a point-and-shoot camera.